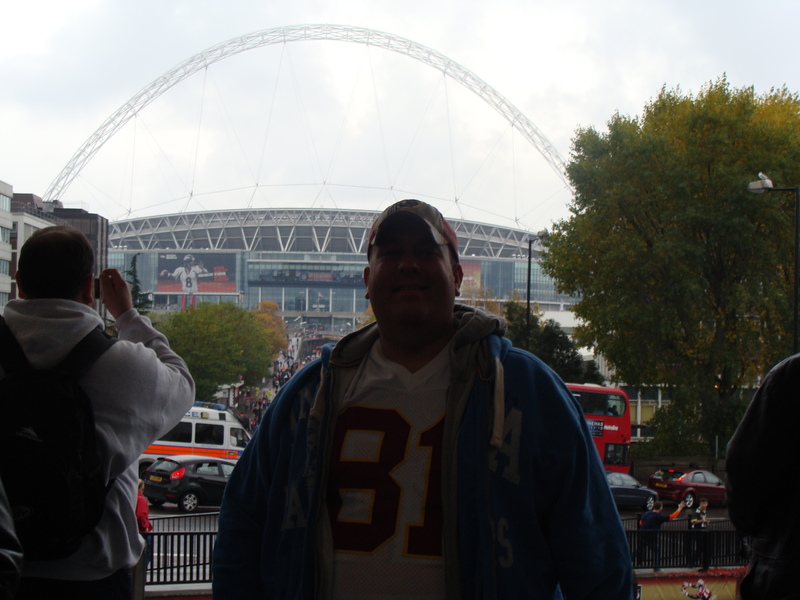 If memory serves me right the last time the 49ers came and played in London, England was in a rather awful pre-season game in 1992 against the Washington Redskins. Lets say I was hoping for more this time around, with starters like Frank Gore and Michael Crabtree playing on the first as well as the last series of the game. The Halloween journey to Wembley was pretty eventful, with a pheasant trying to commit suicide by hitting my wife’s car on the M40. After overcoming that fright-fest we arrived at Hillingdon tube station and I had the pleasure of meeting former First Down editor and current NFLUK writer Keithe Webster. Keith was very gracious, talking to me for a good five minutes. We had a good chat about the survival of the Jacksonville Jaguars, and Keith told me he read a comment I added to an article he wrote about the future of the NFL in England. The tube journey after that was quick, and soon we were at the Wembley Park station. Cue the obligatory shot….. Yes it is a cliche but it has to be done ! It was a blowout when the New England Patriots beat the Tampa Bay Buccaneers at Wembley Stadium in London just over a week ago. The Buccs looked ugly, and I tend to agree with the guy from the Florida Tuskers UFL team (the 4 team league set up this Autumn) that said they could beat Tampa Bay. I imagine one guy who was sure glad to be part of the on-field mobbing was Patriots running back Laurence Maroney. Maroney spent 2008 injured and was not expected to be a huge ‘playa’ in 2009. Maroney has defied his critics and is performing well in a crowded New England backfield. With Sammy Morris injured Maroney made sure he looked good in London, and his late touchdown was a just reward for his efforts. I was lucky enough to capture his score into the Patriots painted end zone. He took two attempts to score but he looked very happy. I managed to catch his celebratory hip hit jump after the score as well as his walk back to the sideline. The three pre-game acts for the NFL International game in London between the Patriots and the Buccaneers were to say the least unable to float my boat. Calvin Harris may have got all the girls, but I can name about 100 acts I would rather have seen do the pre-game musical extravaganza. Someone like The Killers, Kings of Leon or even some Kanye West or a bit of boom boom pow from the Black Eyed Peas. Toni Braxton (blast from the past) did the USA national anthem, but it was not that memorable, and Katherine Jenkins suitably warbled through God Save the Queen. Not that I could see him very well but it was Welsh Boxing world champion Joe Calzaghe who was the Tampa Bay honorary captain who was involved in the coin toss. We were now just minutes from kickoff…..
After adjusting to the sensory experience of the marvels of Wembley Stadium it was time to spot the players from the New England Patriots and the Tampa Bay Buccaneers warming up for this regular season NFL game in London. As is the tradition at all NFL games it is the kickers, punters, long snappers, holders and then the kick and punt returners that take the field first, and Wembley was no exception. It was quite fun to see Steven Gotskowski warm up, but I have to admit it wasn’t what I really wanted to see. That sight came after the offensive teams hit the field to warm up, and a giant cheer warmed the stadium as the starters began to remove the travel cobwebs and get the blood pumping through their masculine North American shoulders. It was then, through my zoom lens, that I spotted the most famous NFL player of the last 10 years, two time Superbowl MVP, three time Superbowl winner and four time Superbowl starting quarterback for the New England Patriots – Mr Tom Brady. It was worth the ticket fee alone just to say ‘I was there when Tom Brady came to England’.